DOTA 2 single player commands (also called Cheats) are very useful way to get familiar with DOTA 2 environment. By enabling these commands you can easily have your desired gold, items, heroes and several creeping options like spawning creeps and killing creeps. For instance, you can test new Warding locations, neutral blocking and so on. The complete list of Dota 2 test commands are available below, have a look! 1. Create a private lobby game in Dota 2 and check ‘Enable Cheats’ box. 2. When the game begins, open you chat chat box by pressing “Enter” button. 3. Write down you desired command followed by dash [ – ]. 4. Press enter and check the results. Disables lane creep spawning. Use -enablecreepspawn to undo this change. 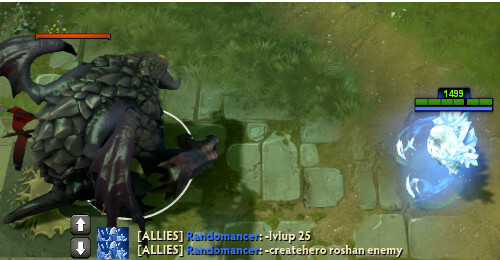 Sets timer to 0:00, creeps spawns…game starts. Removes cooldown, Mana cost etc. Use -unwtf to undo this change. Give all bots the specified item. Displays ping time with server. Note: The above mentioned commands will only work in single player mode. Make sure you have enabled cheats while creating game. We hope these commands will gives you sufficient help to check practice DOTA 2 and have a deep look inside it. Let us know if you have more commands to share! May Bayad DownLoad nyan pero ako nakakuha ng libre pinili kasi ako.. Does this only work on Dota 2? pm na lng sa fb! i just got dota 2.. but its a beta key only. how can i back it up?? cuz i want to format my pc..
auhm…you just purchase the dota 2 game…am i right? okeyy ! window window 🙂 right ba me ? then download it again man. you already bought dota 2…u can just download it from steam if you lost it. I never used a beta key but I’m able to play dota 2 with my steam account..
well you know dat kasee bobo u ? How ? u purchased ? cuz of DOTA IS FREE TO INSTALL IF U HAVE STEAM ACCOUNT STEAM WILL GIVE U THE GAME! maybe a goddamn friend of yours sent u a game gift. -_- use ur heads people! How to enable Cheats ? i need dota can you please help Mee ? plzz help..plagi ng cacrash ung dota 2 q..what should i do?? I can’t create the lobby, can anyone help me please? how to give bot lvlup 25?